After I first swam the 1-mile Bay Bridge Challenge in 2008—the first open-water swim of my adult life—I was immediately curious about the 4.4-miler, which crosses the entire Bay from shore to shore as the 1-miler weaves around a few buoys close to the finish. I asked a swimmer-friend who had done the 1-miler several times whether she recommended the longer distance. 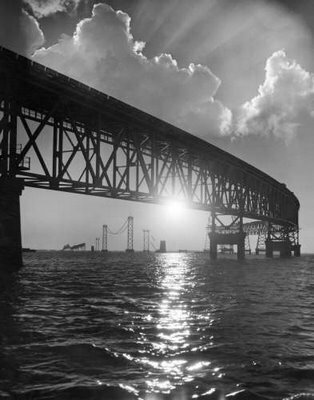 My favorite A. Aubrey Bodine photo of the Chesapeake Bay Bridge, which I'll be swimming beside in June. “The water’s different out there,” she said, with the suspense and mystique usually reserved for describing something much sexier than a swim race. She’s right: There are currents and waves out there you just don’t see closer to shore. A 1992 Baltimore Sun story details safety concerns that led the U.S. Coast Guard to consider not sponsoring the event, thanks to an abnormally strong current in the shipping channel under the bridge during one race in 1991 that led to a massive rescue operation in which 720 of the 884 starters were pulled from the water. Am I the only one who’s more intrigued than frightened? In October, I registered for the lottery for this year’s Bay Bridge Swim, and I spent all of last week waiting for the confirmation e-mail that I’d be among the lucky 700 swimmers to get a spot. The e-mail came on Thursday, and as of this morning, my name appears among the list of entrants. Over the coming months, there will be long swims on the weekends, and weekday swims I need to force myself to complete. There will be experimentation with re-fueling mid-swim (ugh), and trial swims in the Gulf of Mexico on visits to Florida (not so ugh). For today, there’s only excitement (and slight trepidation) about the challenge ahead. For an idea of what the 4.4-miler is like, check out this great video, or this race review from a past participant. Have you finished the 4.4-mile Chesapeake Bay Bridge Swim? If so, tell me everything: training, refueling on the swim, post-race impressions, etc. whoa….refueling mid-swim. I never thought of that! I’m interested in what you come up with. congrats again on this amazing adventure! I’m so excited for you! I know the folks who do the English Channel have people in boats handing them bottles. Maybe you could strap a small bottle of hot soup to your back? Stick under your suit strap? Hmm.